OXFORD, Miss. 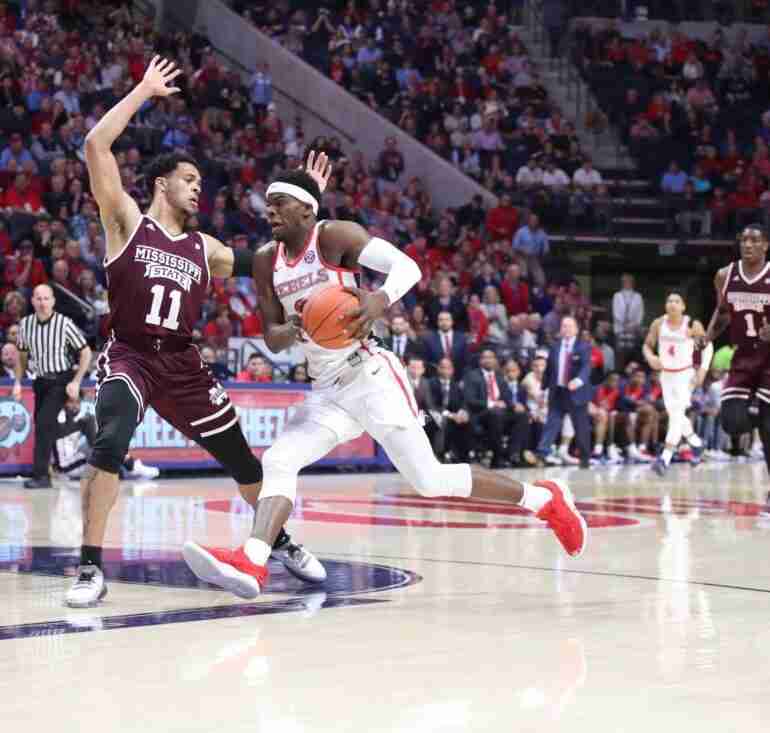 – Ole Miss lost to Mississippi State, 81-75, Saturday at The Pavilion—the first time since 2011 the Bulldogs have emerged victorious in Oxford. (Click here for box score.) The game, featuring two distinct playing styles, is the fourth consecutive loss for the Rebels (14-7, 4-4 SEC). 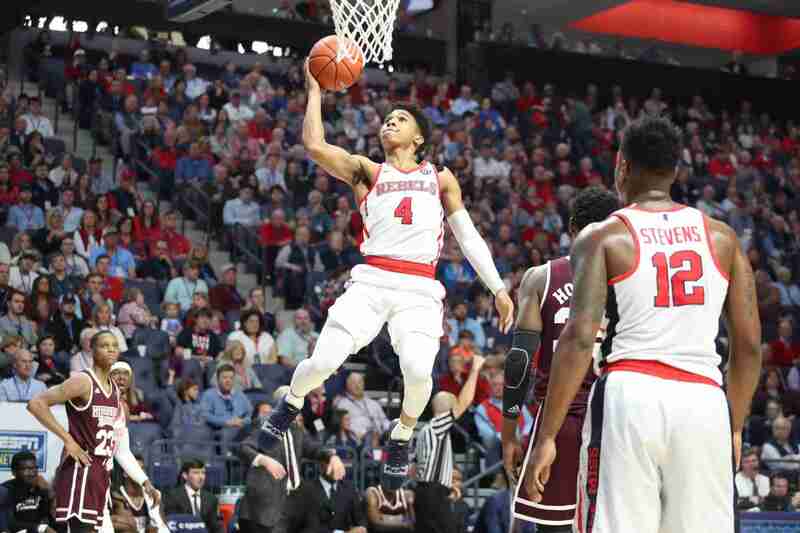 To open the contest between the in-state rivals, the Bulldogs took an early 8-5 lead, forcing Ole Miss head coach Kermit Davis to use timeouts early. “Give Mississippi State a lot of credit,” Coach Davis said in his post game press conference. In spite of State’s stronger post game, the Rebels used the three ball to go on an early 13-0 run that gave Ole Miss a 21-15 lead at the 10-minute mark of the first half. At that point in the contest, Ole Miss had hit 5 of 6 from downtown, courtesy of Breein Tyree and Devontae Shuler. However, the Bulldogs (16-5, 4-4 SEC) responded with their own 9-0 run, giving the visitors a one-point lead with just four-and-a-half minutes before intermission. The teams exchanged baskets in the waning minutes of the first half before Ole Miss took a 43-39 lead at halftime. Two Rebels were in double digits at the break—Shuler with 14 points and Tyree with 12—keeping Ole Miss in the game, despite the Rebs’ spotty play in the post. Mississippi State, at least in the early going, was able to consistently clean up its missed shots with a total of 12 second-chance points. On the other hand, Ole Miss didn’t have much of a need at that point for offensive rebounds due to the Rebels’ success from the field at 56% and from the charity stripe at an impressive 100%. In the early minutes of the second half, State chipped away at Ole Miss’ lead. But up by one, Terence Davis hit a big three and extended the game to four points. Unfortunately, the Bulldogs began to heat up from the field, taking the lead, 62-60, with 9 minutes remaining. A back and forth affair ensued with the Rebels hitting from outside and State scoring in the paint. Trading buckets in their own respective ways was the name of the game over the course of the next few minutes, until Ole Miss began to have no other choice but to foul State to save time on the clock. When the final buzzer sounded, the Bulldogs had hit 5 straight free throws, defeating Ole Miss, 81-75. Tyree gave everything he had, finishing with 25 points, 3 steals, and 2 blocks. Shuler notched 14 points, while Davis scored 15 on the night. Bruce Stevens had one of his better offensive games with 13 points. The Rebels lacked any real interior presence as they lost the offensive rebounding battle, 15-6, and the overall boards battle, 40-28. The Bulldogs used their huge margin on the offensive glass to essentially win the game as they had 19 second-chance points to the Rebels’ six. Quinndary Weatherspoon led the Bulldogs in scoring with an impressive 27 points, helping his team earn its 16th victory on the season. Coach Davis put to rest concerns that his team’s morale might be suffering after four straight losses. Today’s game marked the third sellout of the season and the seventh in the history of The Pavilion. The Rebels are now 2-2 against ranked teams this season. Ole Miss is 9-3 against MSU over the past 12 meetings. The Rebels fell at home to their rival for the first time in eight years. Ole Miss went 12 of 14 (85.7 percent) from the line, shooting over 85 percent for the seventh time this season. The Rebels lost their first game when holding a halftime lead this season (13 games). Breein Tyree scored 25 points for his team-leading 11th 20-point game of the season. Entering the contest, Tyree had 16 career blocks by recording a rejection in 16 different games; he tallied two this afternoon for a new career high. Freshman KJ Buffen made his first career start. Ole Miss returns to the Pavilion Wednesday against Texas A&M. Tip-off is set for 6:00 p.m. (CT), and the contest will be televised on the SEC Network.